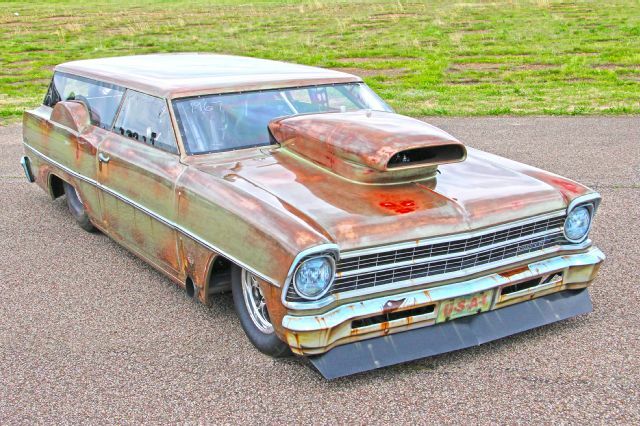 We came across this crazy looking chop-top Chevy Nova Wagon the owner calls the Swamp Thing, and what a perfect name. This might be the ugliest, but yet somehow best looking car we’ve seen in a long time. Apparently the body is all painted to have that “patina” look, but really what’s important is what’s underneath that body, especially because it’s just a fiberglass shell anyways. Powering this beast is a 632 cubic inch motor build by Reher Morrison racing engine and although we don’t know the exact power output we would be whiling to bet its anywhere from 1200-1500hp on the motor alone. And get this, there are two nitrous kits that the driver can add in if he so chooses. First Kit adding 250hp, and the second adding in a whopping 350hp, that is around 600 Hp that the driver can add at the push of a button! That is like adding the additional full power of a ZL1 Camaro onto your Bugatti Chiron. They are racing at what is being called a no-prep drag racing event that basically means the track isn’t swept and prepped with a sticky solution that you would find at normal drag events. Point being, that it’s much harder to achieve and maintain traction to get down the track. They usually only run 1/8 mile and most of the cars that compete are said to be “street legal,” but there has to be a grey area there because I know some of these cars competing in these no prep races are capable of over 3000hp. This type of racing has drastically increased in popularity due to the television shows like Street Outlaws on the Discovery Channel. Having seen most of these cars in person they are absolutely no joke. So if you have a drag strip near you make sure to check out any no-prep events, you never know who is going to show up and what new monster might be lurking out there waiting to be discovered. If nothing else, because of the slippery surface and cars with that much power, no-prep races are damn fun to watch.